Yeah, as the description said, this units is featured in the upcoming mod for Tiberian Sun, Rise of Omnius. This heavy mech is not a skirmish unit, and is to appear during missions (Nod Campaign) as a prototype to capture. I did this unit (the model) long ago but never really finished it. Credit me (Machine) and the mod TS: Rise of Omnius if used. seems than very few people did see that line in my post, I'm including the people at TibWeb . even i misread it for a minute, but i remembered the topic so i reread the post. ETS adds 3rd and 4th weapons along with their respective FLH in art.ini. All you'd need is 3 weapons and properly aligned FLHs with Burst=2. This mech can become into the ultimate superweapon... kind of like what the Mammoth Mk. II was supposed to be, only with 100 times cooler graphics. Yeah, just check our forum; personally I think than my leviathan is better than this one. How about making a spotlighted SHP forum? The main reason for this, would be to increase the quality, and number of the shp files that are submitted. As we can see, PPM has a lot of high quality voxels, which get the precious "spolighted" designation. I, personally, think that the reason of this quality increase it's not just caused by an improvement in voxel building tools. I think that the "competence" to get this spotlighted designation is a big factor. So a spotlighted SHP subforum, should have a similar effect. As an example, I ,as an SHP maker, feel sometimes that releasing a public resource is a waste of time since I won't get recognition, or anything, and the resources that I've made will be easily forgotten with the passing of time. However if we had a spotlighted SHP subforum, the resources that I made could get this "spotlighted" designation, being recognized by the community as one of the greatest SHP works that there is, becoming a "classic", which means that my work wouldn't be forgotten so easily. With this in mind, I think that any SHP maker would want to see that his work is recognized, since that would mean than more people is using it. But to achieve this they'll need to improve the quality of their work, which will lead to better quality SHPs available to public download. As another example, TibWeb, in my opinion, has better quality SHP files than PPM, which mostly get the "spotlighted" designation. Also if we consider recognition as an important factor, we must say that getting it for new SHPers, like me, is way harder, than for a voxeler. Let's have as an example, RLY_BiG_Tank (aplogies in advance by using you as an example) got his voxel maker fame really fast, no doubt about it, since he is a really good voxeler. But what does a new SHPer get?, the answer is almost nothing, just a small chance of being recognized by a modding team, and being recruited, and then the submissions stop. Finally, if you consider that handling a spotlighted subforum is too much work, you could always designate a person who should be in charge of it. I would volunteer, if you decide to make a Spotlighted forum for these files; however I would recommend than someone with more experience, or should I say older in the community, to do it. Thanks in advance for reading this long post, and sorry if this wasn't the right place to post this. Don't worry if you can't answer this quickly, I understand you Banshee, college takes a lot of time of our lives, and it's definitely more important than attending to a small "rant" like this one. I think this forum was suposed to be created some time ago. I just don't know who would manage it. Muldrake is overloaded and I rarely visit the SHPs forum. Does anyone have any suggestions? I would volunteer myself, if nobody else wants to. Other suggestions, dunno I would have said Muldrake, maybe LKO, but I highly doubt he would accept. Very nice for TS, but dont look good in RA2. Next time you do public work can you make it for RA2? The difference is RA2 is about 25% larger and other colors. Most of my work is already bigger than what TS uses, so RA2 users can use it properly. However I accept than this mech may be not big enough for RA2 (It's quite big though, but it wouldn't look kickass in RA2). I would render it, again, in a more proper size for RA2 if I still had the original files (I always keep them though this one got corrupted,and I don't feel like reanimating the model, again). 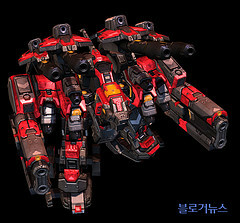 Visiting SC2 sites, I found this (check the attachment), I'm getting scared now; that thing looks like a meld of this mech and my Leviathan (made both before). Note also I gave the zone trooper a SC marine look and a shield before even knowing than Blizzard was going to give shield to marines in SC2. HOLY CRAP, LOOK AT THAT SC2 TERRAN MECH, HOLY CRAP, and back to topic, ur mech really looks like the destroid from Robotech, meh, I actually thought it was! Also you bumped a topic, but is not like I care too much about it, since input is always appreciated. 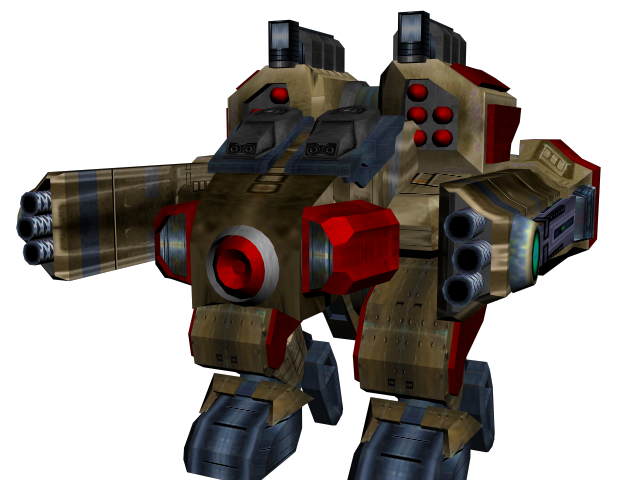 On a side note, the Thor, won't be displayed in SC2 as how it looks in that preview, sadly (it's still a pushing unit, but smaller, faster and with AA cannons instead of artillery batteries )I guess, I should really attempt to make a 3D model of the original Thor. Yeah, when I have some more free time . this Unit will not run under my TibSun ?!? There is the art stuff up at the TOP! And do your own rules, nobody likes copypaste modders. the newbie guide in modding can most probably help you further. and in future give some more info than "help me, it doesn't work"
Oh well as this topic was bumped, I'll make a small announcement; I'll remake this unit for RoO, so I'll be releasing the deploying animation and building state, in some point in the future. BTW, tomorrow, I'll be updating with at least another infantry unit render, Nod's most basic infantry . Also currently finishing Nod's Redeemer cymek. Also currently finishing Nod's Redeemer cymek. MECH! This is not Dune, you crazy heretic! It's not a mech, and it's not a cyborg, is more like a gigantic cyborg, thus cymek. Anyways RoO is highly influenced by Dune, which is why I want my damned sandworms on the game . Anyways if you still consider that heretical, I accept being slapped with the Orange Catholic Bible, . Silly Phobonaut if Machine wants to completely wants to change the feel of Nod so be it. Yes I would still want Nod to have it's own identity and style of play but that doesn't mean they can't have mechs or things that are close to mechs. Besides last time I checked Nod stunk as a playable side despite all the fmv hoopla. Hopefully his changes will allow Nod to truly go toe to toe with GDI in multiplayer in TS. Make a cameo for this beast. I added the previously Rise of Omnius exclusive deploy animation and deployed state of this unit, to the original post, the reason behind this is that I already have an updated version of this unit included in the mod. Alternatively, if you don't feel like scrolling to the top, just click here. Also there's no cameo made of this unit, since RoO uses a custom cameo style, with a built in sidebar style, and I can't make a cameo from a render since the original model got corrupted, and I don't have enough free time to justify fixing the model to just make a cameo. Anyway, Fantastic and brilliant model, but i have 1 slight problem... the turret disappears for me when deployed, everything else is fine, anyone have any idea's? If i can register tomorrow, i will, and will post more info, but any quick fire idea's would be very welcome. Add it as an animation? And yes, the turret should have been named "DHWR_A", instead of "DHWRR_A" to keep the naming convention, but I added an extra "R", before the "_A", something that took me a while to notice.